Drive through the Tromo’s snow-covered countryside on this snowmobile expedition. Not only will your guide teach you how to drive, but you’ll follow him or her through the best areas to see the Arctic Sea and the Lyngen Alps. Take a break to warm up with coffee or tea, and then enjoy a hot meal before you’re dropped off at Scandic Ishavshotel. A fantastic opportunity to be James Bond for a few hours! 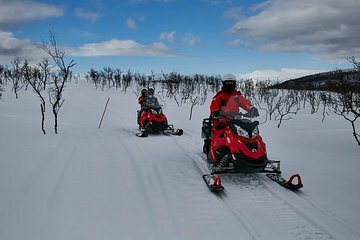 The driver and the guide were excellent, supplied us with all the necessary kit, gave a very good introduction to driving the snowmobile and then started off with an easy ride and then gradually got more challenging. The final ride to a frozen lake was exhilarating. All the time the guide was checking no one had fallen behind and took very good care of us. The meal at the restaurant afterward was delicious with some of the best soup I have ever tasted. You are driving in the middle of nowhere and the views are extraordinary - well worth going on this tour.